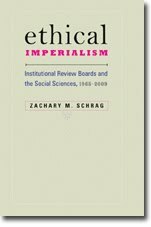 Research Ethics has published my article, "The Case against Ethics Review in the Social Sciences." The article appeared in print in December 2011, but it has only recently appeared online. The article gathers many of the arguments made in the first five years of this blog. As permitted by the Sage policy, I have posted an April 2011, pre-review draft at http://papers.ssrn.com/sol3/papers.cfm?abstract_id=2061633. I hope that readers with access to the published version will consult that instead. For decades, scholars in the social sciences and humanities have questioned the appropriateness and utility of prior review of their research by human subjects' ethics committees. This essay seeks to organize thematically some of their published complaints and to serve as a brief restatement of the major critiques of ethics review. In particular, it argues that 1) ethics committees impose silly restrictions, 2) ethics review is a solution in search of a problem, 3) ethics committees lack expertise, 4) ethics committees apply inappropriate principles, 5) ethics review harms the innocent, and 6) better options exist. Sieber and Tolich Lament "Medical Model"